During the early period of the growth of our country, the rail system became the way to travel from point A to point B on land a bit faster than a horse and buggy. The first steam locomotive was built in the US by Peter Cooper and called the Tom Thumb. It was the first to be operated on common-carrier railroads. Our country was only about 50 yrs old when this occurred. The first track did not cover a great distance; a mere 13 miles. From this meager beginning emerged rails which crisscrossed our great land many times over. The width of the rails is 8' apart. This distance is traced back to Roman chariots which had rims of that width. Even our normal size cars today have the same wheelbase. The first system was launched on Feb. 28, 1827 and carried both passengers and freight. Now the farmer had a faster way to get his crops and animals to larger towns and cities. The advent of the train did not deter our early pioneers from using the more accepted mode of transportation, the covered wagon. As more railroad systems were built, people began to see the advantage of traveling by train. 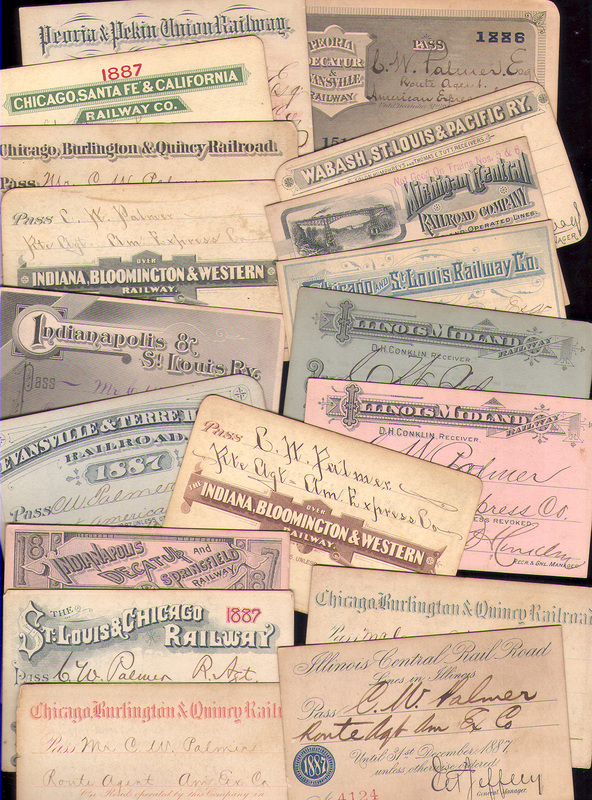 This shows many of the trains that operated in Ohio, Indiana, Michigan and Illinois. The passes are from 1886-1889.